This is a 1m multicolored 12-fiber single-mode fiber (SMF) OS1 LC pigtail. 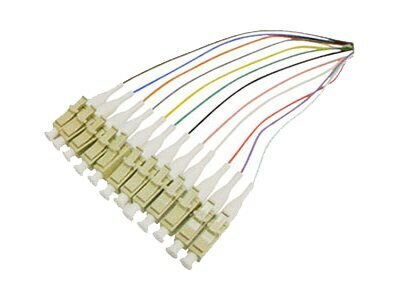 This 12-fiber cable comes with 12 individual LC connectors on one end, and fusion splice on the other. The most common use for this cable is within a patch panel with splice tray environment. Our patch cables are 100% compliant for all of your networking needs. Each cable is 100% optically tested for insertion loss before you take ownership. Now you have a cost effective solution to all your network upgrade needs.